Buy CISS Brother MFC-465CN and make 30 times more quality prints for the same money! Pay only 0.04 USD for A-4 full color print! Every printer user thinks about economy and convenience. No wonder, scientists and engineers invented a device to suit our needs. Such devices as CISS FOR BROTHER DCP-120C or ink system for brother mfc-465cn are invented to help printing comfortable, time and money economizing process. Generally, Continuous Ink Supply System is the analogues to original cartridges, the only difference is in budget you spend. Simple calculations, test in laboratories and common sense make easy to understand why CISS is popular. 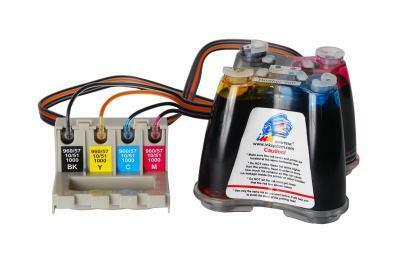 We apply it in home printing, offices and for professional purposes. Printing everything from ordinary text documents to colour booklets is not a problem for the device. It is made of high quality materials. First, tanks are made of plastic and have air filters for inks not to spoil. Then CISS for mfc-465cn is supplied with highly-strength silicon cable ink goes through. Colours don't mix as every ink has its own pass to the cartridges. Cartridges with chips, identic to original, are connected to a printing head. When inks reach this head, a printer starts to work and we get what we need: texts, photos or others. It works for any system, and CISS FOR BROTHER DCP-115C performes the same. save your time as you don't need to buy new cartridges every time inks end up. Your printer works p to 20 times longer. More, you see clearly how much ink is left end if you know you may forget to refill it in time, just buy a set of inks before hands just to be able not to stop printing. We conclude, that CISS for brother mfc-465cn is a perfect alternative to an original cartridges of all ink jets.